The newly created BYU-Idaho offers an innovative approach–a new way of looking at higher education. Yet amid all its changing, the school is preserving the miracle of Ricks. Wind washes almost incessantly over the plains and rolling hills in southeastern Idaho’s Upper Snake River Valley. Unlike the nearby St. Anthony Sand Dunes, which the wind drives an average of eight feet each year, the valley’s rich soil is held firmly in place by a vast carpet of potato and grain fields that extend a defiant green over the semiarid landscape. The fields’ root system at once sustains the valley’s residents and resists the elements’ eroding influence. Perhaps in fulfillment of this bold prophecy, on June 21, 2000, Gordon B. Hinckley, President of The Church of Jesus Christ of Latter-day Saints, announced the school’s change to Brigham Young University—Idaho, making it a four-year university and marking the beginning of a new season of growth. 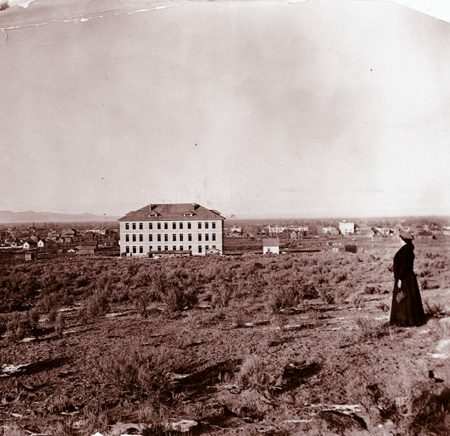 As an extension of the school’s heritage of hardy progress and pioneering spirit, BYU—Idaho was charged with considering everything afresh while remaining firmly rooted in its foundation of simple faith and dedication to nurturing students. He wasn’t alone. No one in the Ricks community expected the change—not even the school’s president. For years the board of trustees had maintained Ricks as a two-year college because of the expense of offering upper-division courses; fear that Ricks would lose its intimate, nurturing feel; and concerns that such a change would create an unrealistic expectation of future Church-operated universities, says Elder Henry B. Eyring, Church commissioner of education and a member of the Quorum of the Twelve Apostles. The Bannock Stake Academy steadily grew and changed from its infancy in 1888, when 40 bushels of wheat, two steers, and $186.10 in cash were gathered to purchase desks for the 85 students who attended the first session. In 1903 the school was renamed Ricks and moved to the newly completed Spori Building. 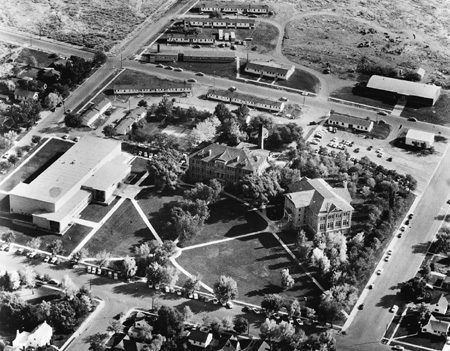 Nearly 100 years later, when BYU—Idaho was announced, the campus facilities had multiplied into dozens of modern buildings accommodating some 8,600 students. 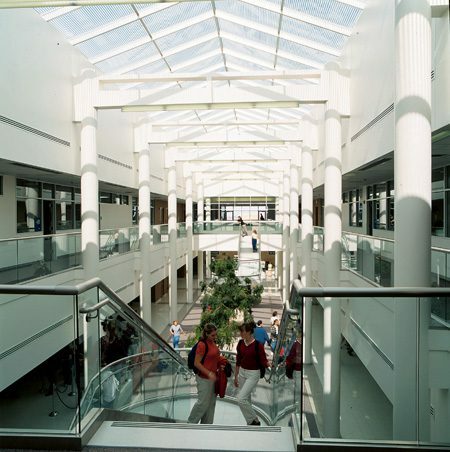 Though there will be a significant expansion in the number of students and a modest corresponding growth in the size of the campus, the changes brought about by the creation of BYU—Idaho center more on academic philosophy than physical facilities. And administrators and faculty are questioning everything. Even more sweeping are the changes to the academic offerings (see “Academics: Studying for Real-World Tests,” right). “It’s a gigantic step from a two-year program to a four-year program,” says academic vice president Donald C. Bird, ’69. “It has been a huge task for all of us in the academic area.” Retaining many of its associate degrees, this fall BYU—Idaho will introduce the first 17 of the 50 bachelor’s degrees to be phased in by 2005. Along with traditional bachelor’s degrees,BYU—Idaho will offer “integrated” degrees, which blend disciplines and use internships to prepare students to make an immediate impact in the workplace. School officials were equally inventive as they considered changes to the athletic program (see “Activities: Expanding the Roster,” p. 38). “Intercollegiate athletics are going away,” says Garth V. Hall, ’82, vice president of advancement and former athletic director. “But athletics are not going away.” In the place of varsity athletics, administrators have created an activities program that will make athletics, performing arts, and other recreational activities available to any student who wants to participate. Included in this program will be a competitive level, where athletes will try out for teams, be coached, and compete for a school championship. These developments, taken together, make BYU—Idaho unique among institutions of higher education. “I think some of the things we’re doing here will create a fresh approach, a new way to look at things. Other college administrations are going to watch with interest,” says Kinghorn. In 1994 Robyn H. Bergstrom, ’76, returned to Ricks, her alma mater, to interview for a teaching position. As she walked across campus, she remembered buildings, smells, and landscape, but mostly she recalled the feeling emanating from the campus. “There was this enormous feeling of belonging, of trusting, of caring that just enveloped me,” she says, now in her eighth year on the communication faculty. As the school becomes BYU—Idaho, administrators are similarly determined not to allow the school to be uprooted from its character and history. Accordingly, the school has announced a new academic building and demonstration gardens that will be named after Thomas E. Ricks, preserving his legacy for BYU—Idaho’s future. Part of sustaining the Spirit of Ricks, says President Bednar, is telling and retelling the stories that have defined the school for more than a century. These stories recall how Principal Spori had his salary applied to the academy’s debt to help keep the fledgling institution solvent and how early teachers accepted produce instead of pay for the same reason. They tell of legendary professors and administrators who saw the college through perilous times. And they tell of an uncommon dedication to teaching and nurturing students. 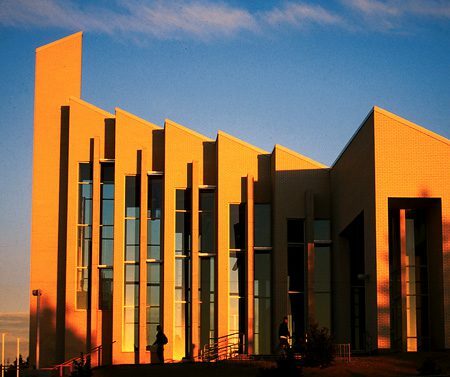 To keep the focus on education, faculty rank will not be part of BYU—Idaho’s academic system. “One of the unique things about BYU—Idaho will be the fact that we are emphasizing the scholarship of learning and teaching,” says Bird. To maintain the campus’s intimate feel, 100 new faculty will be hired over the next five years, keeping the student-to-faculty ratio at 25:1. For years a continuous stream of transfer students has coursed southward from Rexburg to Provo, as students seek bachelor’s degrees after spending two years at the Ricks College campus. 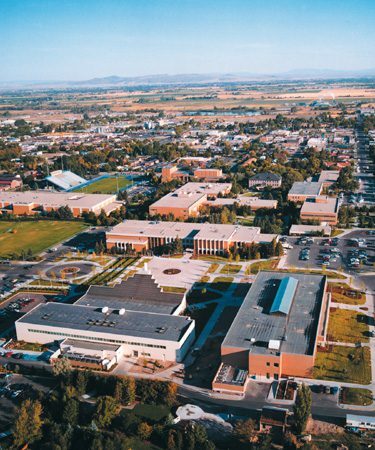 As BYU—Idaho begins offering bachelor’s degrees in fall 2001, not only will that flow taper, but it may become normal to see students occasionally rippling northward instead. Although BYU—Idaho’s educational aims will overlap with BYU‘s, the school hopes to give graduates distinctive preparation to make an immediate impact in the workplace. “If students get the kind of education I think they will, it will create a remarkable kind of employee,” says Elder Eyring. 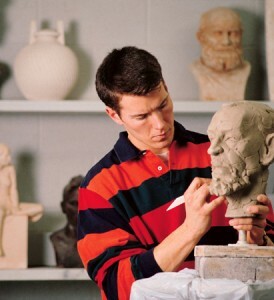 In fall 2001 BYU—Idaho will add to its associate degrees the first 17 of 50 bachelor’s degrees to be phased in by 2005. Though BYU—Idaho will offer traditional specialized bachelor’s degrees, which require 70 credit hours in the major, the backbone of its educational structure will be its innovative “integrated” degrees, which allow a maximum of 45 credit hours in the major. To these, a student will add complementary courses from other disciplines to provide a solid base from which to launch a career. Another aspect of BYU—Idaho’s educational plan that will appeal to potential employers is the emphasis on experiential learning. Most students will be required to complete an internship related to their field of study. “One of the key features is the linking of what you do academically to an internship experience, where you put the knowledge and skills into practice,” says President Bednar. He also notes that, because of the school’s track system, many BYU—Idaho students will have the advantage of being off track during the traditional school year, when there is less competition for internships at top companies. Administrators and faculty see this as a formula for success. “For our graduates a BYU—Idaho degree will say that this person is ready to hit the ground running, make an immediate contribution, and quickly become a leader and a supervisor,” says Kevin P. Shiley, ’79, a business professor and chair of the Business Management Department. In the press conference Gordon B. Hinckley, President of the Church of Jesus Christ, cited the massive expense of running a large-scale intercollegiate athletics program at a remote school like Ricks as the reason for the change. He said he hoped BYU—Idaho could have a different focus. As the news rippled through the community, sports enthusiasts were shocked. Because of the Vikings’ winning tradition, nobody expected change. Garth V. Hall, ’82, who then served as athletic director, sums up his initial reaction in one word—devastation. “This has been a tough year,” says Hall, now the school’s advancement vice president. Hall’s devastation, however, has turned to enthusiasm for what is to fill the void of intercollegiate athletics at BYU—Idaho. When President Hinckley offered a sketchy description of a year-round activities program, Ricks administrators caught the concept and ran with it. What they came up with is a comprehensive program that will include a diverse range of group and individual activities—from snowshoeing to basketball—available at recreational, intramural, and competitive levels. “The final level will be a competitive level, where we want to make it as intense, competitive, and demanding as we possibly can,” says Hall. “That will require kids to train, have expert coaching and teaching, and perform in a competitive environment.” Although the initial offerings will be mostly athletic, the program will later include art, social, and leadership activities. “Our hope is that it will have something for everyone,” says Kinghorn. “When you look at competitive sports, we can serve many more students than the 286 intercollegiate athletes whom we currently serve.” Additionally, he believes the new intramural-level program can triple or quadruple in size from the current 1,500 students it now serves. Finding a place to house a program of this magnitude has required ingenuity. Administrators realized that since the school would no longer need to conform to theNCAA seasons, they could shift the seasons of sports that once competed for space. “So we’ve created space without really building space,” says Hall. Using existing facilities such as the basketball arena and football stadium, the program—which will start in fall 2002—will include such ticketed events as a school final-four basketball tournament, Summer and Winter Olympics, concerts, art shows, and recitals.